As far as 1800’s tech goes, pinhole photography is an great example of material acting as more than the sum of its parts. If you’re in the market to be blown away by something you normally ignore: make one over the holiday. You don’t need this book—all that you need is a lightproof box with a hole in the front (mini-hangtag safety pins yield a perfect 0.3–0.4 mm hole) and some light-sensitive material loaded in the back. The results achieved by such humble means is a feat of true cosmic piggybacking—showing that objects we make (even from the most lo-fi materials) can be structured to tap into impressive forces at play in our world. To see more results: I’m posting sample photos taken with the cameras with #thisbookisacamera on the social things. The project was supported in part by the Adobe Creative Residency (and produced in multiples by Structural Graphics). The reason why a hole in a lightproof box can perform a function similar to real photographic equipment is due to light’s intrinsic tendencies. Light steadfastly moves in a perfectly straight line. In a normal environment, light beams bounce around ambiently—their cacophony of trajectories eager to fog a piece of photographic paper with a muddy multitude of images. Why work on some piece of antediluvian technology while sitting in a studio surrounded by high-tech tools like lasers, Graphtec cutters, and Illustrator? For the past few years, I’ve been trying to better understand forces at play in the analog world through a process of subtraction. To do this, I’ve been disassembling everyday tools, stripping off their normal interface, and reducing them down to their functional minimums. The value in this eccentric hobby is best illustrated with a past work-example: We frequently take for granted that music occurs because “we pushed play,” but what truly enables sound to reach our ears? In 2011, driven by sheer determination to recreate an experiment from a 1980’s Mr. Wizard episode, I made this paper record player invitation for my friends Mike and Karen’s wedding. Using only humble materials and handmade construction, this “device” corrals minute soundwave vibrations from a needle up into a paper tunnel, which in turn amplifies those waves into audibility. We knew this thing would be super-cool if we got it to work, but even we were surprised by the result. With a gesture, the paper device effectively demystified the exact thing that tech obscures: it syncopates the experience of sound with touch — demonstrating the different sensory ways that vibration manifests itself (a fact that is nevertheless difficult to grasp when stated verbally.) It essentially connected what we had been told was true about sound with what we could actually feel, firsthand. Thinking with your hands—and showcasing the wonders of the physical world—turns out is addictive. I got hooked on the slow (but varied) thrills of paper engineering. In pockets of time between projects, I’ve devised fifteen functional, but rough prototypes for lo-fi pop-up devices that I hope to one day make real. Six of these contraptions will appear in a forthcoming book, which is being mass-produced by Chronicle. This Book is a Planetarium morphs from being a planetarium, to a spirograph, to a musical instrument, to a perpetual calendar, to a decoder ring, to a speaker. The pop-ups are supported by text connecting the dots between form and the hidden forces at play in the physical world. It will be at Barnes and Noble and Wal-mart and everywhere come Spring. The remaining nine prototypes were deemed too complex for mass production. However, when the release of This Book is a Planetarium was pushed back*, I was eager to self-publish one of the rejects. This pinhole camera is one of those rejects— refined to stand on its own, but will also enhance the collection when it materializes. That is the plan. Once I had a rough plan, I began drawing my score/cut lines in Illustrator (arranging them on separate layers so that I can output the score lines with 50% of the force of the cut lines.) This is a prototyping trick taught to me by Jeff Rutzky, who is a bit of a Craft Robo expert. The funny thing about this line of work is how disappointing the whole process is… until one day, it miraculously isn’t. The only great camera that I made was the last camera. However, I prototyped and destroyed at least 50 of them until I found one that succeeded in accommodating easily-procurable film/paper types, yielded a book-sized book, collapsed to a not-ridiculously fat shape, resembled a camera, produced reasonably sharp photos, and didn’t cost more to produce than a reasonable sales price. None of these things automatically worked — each requirement was its own separate a battle. Once I had the structure determined, I photographed the blank dummy and Photoshopped-on a design. 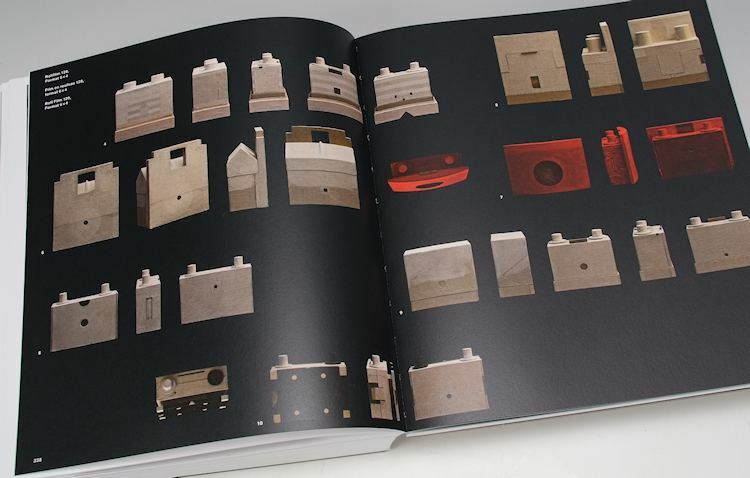 While researching, a friend recommended looking at Peter Olpe’s hundreds of different pinhole camera designs. The man is simply amazing: he is a Swiss graphic designer who has been crafting unique pinhole cameras for artists for years as a trade for their work. In his book, you witness the enormous effect that small design changes in the morphology of the camera body exert over the resulting image. Because of the potential for experimentation here, a DIY hand-assembly version of the dielines is published under a Creative Commons share-alike license. Please feel free to download the cut and fold lines to DIY it, to examine it, rip it apart, or to develop a completely new variation. (Although manufacturing your own version of the book to sell is not-ok.) Note: Use a thin, but truly opaque black paper. The book uses Mohawk Antique Vellum in Black in the lightest text weight, but Neenah’s Classic Crest text (in Black in the lightest text weight), and Curious Skin (in Black in the lightest text weight) also performed well in tests. Achieving this specific focal length is important—the tabs also help to keep the book flat, rigid and hold steady. Be sure to unlock those tabs before closing again! When bent backwards, they lose their functionality. 3.) Shoot a photo by raising the shutter for the desired exposure time. Exposed photo paper will “keep” for months, so you can store your undeveloped photos in a light-tight envelope and develop them all at once if you want. 4.) Develop your photographic negative. 5.) Invert and correct it! Q: Where do I purchase additional paper film? Q: Does it only take black and white photos?